All this buildup to Jeremy Deller's Procession (which looks to be amazing) has renewed my appreciation for the humble parade. And sent me searching for a half-remembered Maurice Sendak (?) book I had when I was little about a parade featuring all kinds of unusual groups of people - people with moustaches and/or people who slurped soup, among others? Anyway, I can't remember what it's called, so if it rings a bell for anyone let me know because I'm going crazy here. Maybe I should ask Jeremy Deller. 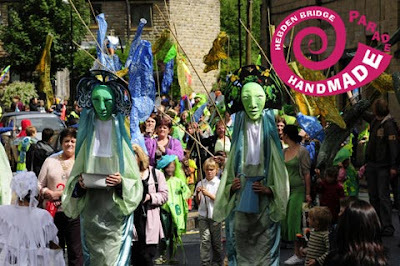 And if you'd like to whet your appetite for Procession by checking out another unconventional parade, head over to Hebden Bridge Saturday at 2pm for the Handmade Parade. As you'd expect from a town "internationally known for its funkiness" and indeed for the seriousness with which it takes its role as right-on capital of Albion, this is a parade with rules: No written words or logos, and no motorised vehicles. They are good rules, though, so we can't poke too much fun at them, and the parade sounds terrific, with puppets (which look a lot like the ones at my beloved Bread and Puppet in VT), dancers, handcrafted floats and a samba band. There are workshops if you'd like to make something yourself and march in the parade, which is followed by a pageant and a big picnic in Calder Holmes park. This year's events have a Glorious Garden Party theme, so expect to see lots of adorable wee trustafarians cavorting in handmade butterfly costumes. A parade (also called march or marchpast) is a procession of people, usually organized along a street, often in costume, and often accompanied by marching bands, floats or sometimes large balloons.